I no longer subscribe to magazines but I fondly remember the good old times when I first started subscribing to my favourite fashion magazines like Cosmo and Elle during my university days. My schedule as a student was less hectic so after a day of studying and working in uni, and I had ample time to pore over magazine after magazine when I got home. It was also very cheap to subscribe to magazines back then so the decision to jump into the magazine bandwagon was happily made with ease. I collected quite a few titles too, which weren’t available here in Malaysia and when my boxes arrived from the States two years later when I returned home to KL, I was ecstatic to have my collection with me! It was a hefty price to bring them home with me but a girl’s gotta do what a girl’s gotta do sometimes! Nowadays, I don’t really buy magazines anymore unless it’s one of those Hollywood entertainment magazines, which I love and a few local celebrity magazines. Other than that, I usually get my information and need to browse through a magazine, online. I love reading about Hollywood celebrities so I have quite a list of dazzling celebrity blogs, which I follow. Recently however, I came across an awesome site offering Magazine Subscriptions at incredible discounts so once again I am enticed to start collecting magazines. I really should not because I don’t want to end up being a magazine hoarder. If you’ve seen an episode of Hoarders, you will definitely share the same sentiments as yours truly and will try to avoid compulsive shopping whenever possible! Having said that, I figured a title or two won’t hurt especially since I discovered some really cool cat magazines online! 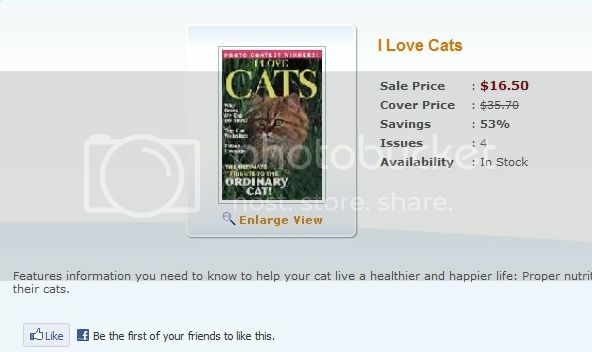 Cat magazines don’t come by very often, perhaps due to the niche market it caters too. But for cat lovers like me, I’m certain we wouldn’t mind spending on and owning a collection of cat magazines. If not for the very useful information contained within, cat magazines almost always offer awesome cat photos too, which is mostly why I am enticed! 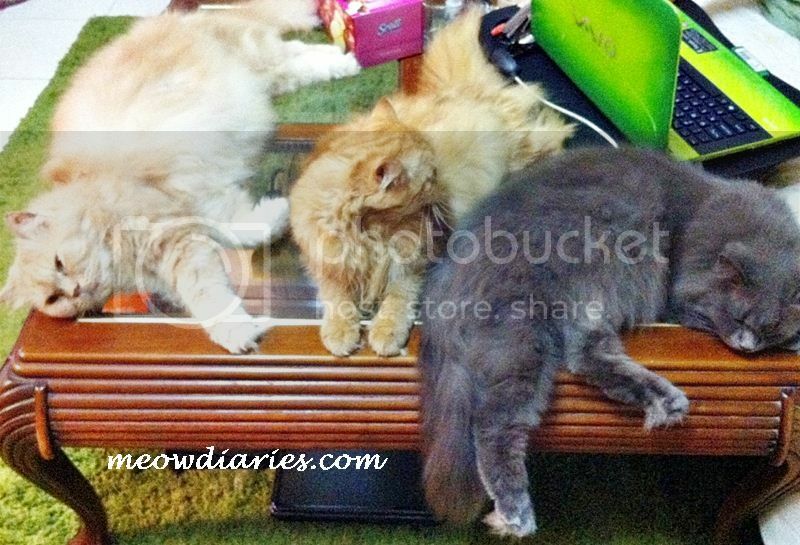 Check out the meow-licious rates of this really cute I Love Cats magazine! Oh, I also collect TV soap magazines and these I usually get when travelling abroad. If you don’t already know, I am an ardent fan of Bold and Beautiful and I love reading stories about the Forrester clan! This site I discovered however does not seem to offer TV Soap magazines unless I missed it while browsing through their endless categories. With so many categories to go through and loads of great discounts to take advantage of, I’m definitely checking in with this site again later. Tonight however, I am going to be very busy preparing for the Eid Mubarak celebration tomorrow. I would like to take this post to wish all my friends celebrating this festival a wonderful Aidilfitri with your family and loved ones. Drive safely to and fro your destination, eat aplenty, be merry and Maaf Zahir Batin from Mariuca & B and our four fluffy cats! Phoebe and her pinky tongue!